Born at Plymouth, England on 9 September 1754, Bligh’s life was characterised by controversy. He joined the British Navy in 1770 and quickly rose through the ranks so that by 1776 he was master of the HMS Resolution during Cook’s third voyage to the Pacific. In 1787 he became Commander of HMS Bounty and was assigned the task of transporting breadfruit plants from Tahiti to the West Indies. On 30 April 1789, led by Fletcher Christian, his crew mutinied near Tahiti. Accompanied by eighteen loyal crew members in an open boat less than 8 metres long Bligh achieved the extraordinary feat of sailing some 6030 kilometres to Timor in six weeks. The subsequent court martial acquitted Bligh of any wrongdoing and he was promoted to captain by the British Admiralty. In 1805 Bligh accepted the governorship of New South Wales. He arrived on 6 August 1806 with strict instructions to curb the illegal liquor trade in the colony. Bligh failed to established any rapport with the colony’s hierarchy. His insistence on adherence to rules led to a series of clashes with members of the New South Wales Corps and the local establishment. These culminated in John Macarthur accusing him of sedition and Major George Johnston arresting him on 26 January 1808. This has become known as the Rum Rebellion. He was held in Sydney for a year and it was not until February 1809 that he was placed aboard a ship and ordered to return to England. He went first to Tasmania and then returned to Sydney in January 1810. 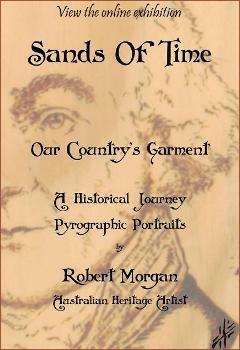 He finally left for England in May 1810. When he arrived, he was totally exonerated of all wrongdoing and promoted to Rear-Admiral in 1811 and Vice-Admiral in 1814. He died in Kent in 1817. Born in England on 3 May 1756, Collins became a Second Lieutenant in the British Navy at the age of fifteen and was a Captain by the time he was twenty-five. In 1787 he sailed to Australia with the First Fleet having been appointed Judge-Advocate for the new settlement. Upon the arrival of the First Fleet he was given the additional responsibility of being Governor Philip’s secretary. Collins stayed in the new colony from 1788-96 and in 1798 published a description of life in the colony titled an Account of the English Colony in New South Wales. In 1803 Collins was given the task of establishing a new colony at Port Phillip. He arrived in teh bay with three hundred convicts, decided the area was unsuitable for a settlement, and with the permission of Governor King, moved to the Derwent River in Van Diemen’s Land. Thus, on 16 February 1804, Collins landed at Risdon Cove and established a settlement on the site of modern-day Hobart. Early years in the colony were difficult. The population grew slowly, there were often food shortages, and Governor Bligh used the colony as a base after he had been removed from the governorship in Sydney. In spite of these difficulties Collins was regarded as a fair man by both settlers and convicts. He died in Hobart Town on 24 March 1810 and was buried on the site of St David’s Church.